That’s so formal a greeting for such a tiny little man. But as this is a letter, I should write it properly the way my high school English teacher, Mr. Palmer, implored us to do so that the art of letter writing is not lost. Someday you and I will write letters to other family members. We’ll painstakingly print your name and apply stamps to the envelope that encloses your most recent picture. Part of me can’t wait to get to that part of being your mom. I want to watch you run and dance and jump at the playground exploring every little nook of the highest slide in the park. And another part of me wants to make sure you never get any older. That you stay this tiny and perfect forever. I don’t mind admitting that it brings me so much pleasure to bathe you, separating your tiny toes to wash them. I like picking out your outfit for the day (if you don’t spit up on it and need a change of clothes at some point.) And it gives me so much pride to show you off. Everywhere we go, everyone comments on your gorgeous hair. I proudly tell them that you were born with a head full of blonde locks. Where you got the blonde is a bit of a mystery as your father and I are both brunettes. But we suspect it’s from your paternal grandfather, James, who was also a blonde in his youth. You resemble your father’s older brother, Darren, a bit with that hair. But in private, your father gushes over your nose which he feels looks exactly like mine. Pug or button-nosed is how I was described as a baby, but for some reason I don’t want to apply that descriptor to your nose. Maybe I think it’s a feminine way of describing a nose. What would be a masculine way to describe it though? No idea. All I know is that I agree with your father and think it’s adorable. I stare at you often at night. Not only to be sure you’re still breathing when you’re so still and quiet, but also to marvel at how beautiful you are. Or handsome. You are a boy after all. A big one too. At the doctor’s office on Monday, you were 10 pounds! That’s all of your lost birth weight made up plus seven more ounces! So at least I know that you’re getting enough milk from me. Every morning your father picks you up and says, “I think you’ve grown in the night.” He’s probably right. Last night the moon was full and woke us up shining into the bedroom window. You were happy to have some milk and fall back asleep, but I didn’t fall asleep again so quickly. It’s a mother’s curse I think. Baby wakes and can fall back asleep quickly, but not mama. And of course, in the dark and quiet, I thought of my own mother and cried. Oh Gibson, she loved you. I know she was already ill by the time you arrived, but she loved you. Your aunt, Amanda, told me that she would spend hours looking at your pictures on her tablet. She’d scroll back and forth looking at them over and over again in her hospital bed. I don’t know if she thought of you in her last moments. But I like to think she was keeping her daughters and her sole grandson in her heart as she passed. Some days I think I should write a short story about how you two met- the way I thought you two would meet. It would have been about now, when you’re a healthy one month old, when she could have found the time to drive up from Tennessee to meet you. I think she would have been so giddy to hold you that she’d put off bathroom breaks and eating just to keep you in her arms. She’d call you Gibs and The Gibster. Most horribly she liked to tease me that she would call you Bubba which your father and I were not fans of at all. I’d be ecstatic to hear her call you Bubba right about now. Yesterday, you had horrible gas pains that kept you up and angry all day. I don’t blame you. And your inexperienced parents didn’t know how to soothe you at all. Thankfully we found out about gripe water and that seemed to do the trick. I couldn’t help thinking (after you calmed down and I could think again) that I wish I’d know what my mother would have done in the situation. I hate, just HATE, seeing you in pain. You had to have your second Hep B vaccination at the doctor’s office on Monday. Oh you cried. But I don’t know who cried more, you or me. 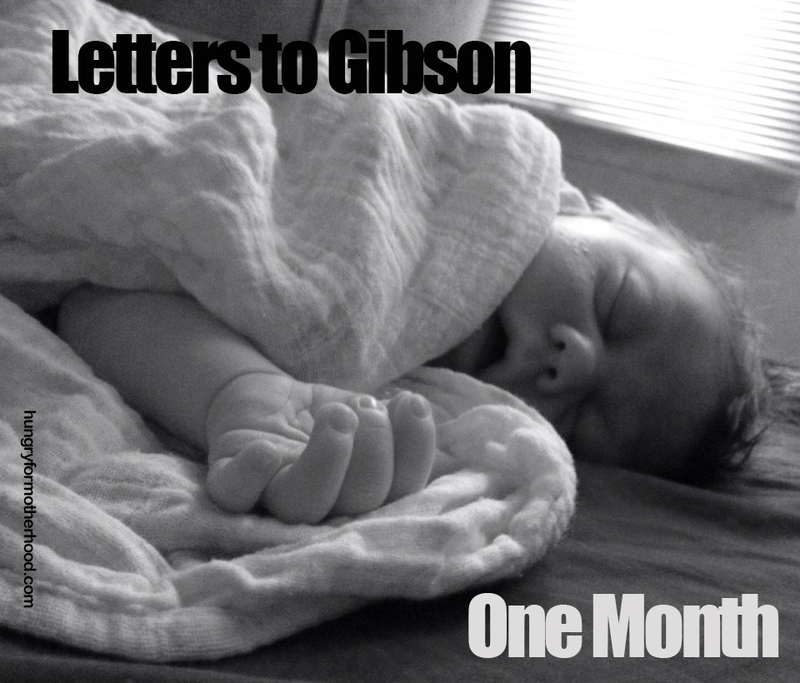 We’ve gotten to know each other a lot better in the last four weeks, Gibson. You seem to recognize me and your father when you open your eyes first thing in the morning. You have started establishing rituals with us. Every morning, you have a quiet time (after being changed and fed) with your father. You two listen to electronic music. Usually something from video game soundtracks. Your eyes sometimes seem to blink in time with the music. Every night (now that your belly button is healed- it’s an innie!) we take a quick bath just to wash the day off of you. Then you get powered, diapered, swaddled, fed and put into your bassinet. So far, that’s been working well to get a least two hours of sleep in for the two of us before you wake again. Once you even let us sleep four hours in a row after this little ritual! We think it’s a keeper. The most surprising thing I think I’ve learned about you is how much you like showers. One morning, you needed a bath, but time was a issue. So instead of showering myself and then setting up your baby bucket, your father handed you to me in the shower. You LOVED the spray on your hair and were calm the entire time. I don’t think you cried even when the shower was turned off and you were being diapered. That’s another thing: you love the sound of running water. Sleep Sheep plays the sounds of the ocean almost all night for you because when the 45 minute timer turns the sound off, you start to stir. I usually hit the button and fall right back to sleep. All hail Sleep Sheep! There’s a thousand other little things I want to remember about this time with you. Your blue eyes had a ring of brown around the pupil when you were born. Now that ring looks more like silver. I think your eyes may stay blue, but they are such a deep, matte blue that maybe they will change to brown as I suspected when pregnant with you. Of course, I thought you’d have curly brown hair if you had hair at all when you were born. I love the way you grunt and snuffle when eating while sleepy. You often grunt when I feed you at night and then detach from the breast and sigh contentedly to sleep. You are always facing me in your sleep even if I put you down in the opposite direction earlier. When you sleep you like to lay on your side. Doesn’t matter which side so long as you’re facing mommy. And you keep the hand that you’re not laying on against your cheek. It’s like you’re Sally Jessy Raphael listening to my response to a question you’ve asked me. But you’re eyes are closed, and you are dreaming tiny baby dreams. I love you more than I understood I ever could. It’s a different type of love that I’ve not experienced before. I wish I could really give it words. Maybe as you and I grow together, we’ll be able to better describe this love thing. Right now, you are listening to music with your dad and the image of the two of you just twists my heart until it wants to burst. I’m going to make breakfast for us. You will get the bacon second-hand later this morning. Beautiful. I share so many of these sentiments but I don’t think I could ever write them down so nicely.